A 25bp rate rise with the Fed “dots” showing a strong consensus for 3 hikes next year. As widely anticipated the Federal Reserve has raised rates at today’s FOMC meeting - the third 25bp move of 2017. They last hiked back in June when Neel Kashkari was the sole dissenter. He was joined by Charles Evans in opposing today’s action. Neither will be voting next year though, leaving the committee with a more hawkish tilt for 2018. The accompanying statement suggests the FOMC is increasingly upbeat on the growth prospects, pointing out that the labour market “remains strong” while removing some of the more hesitant language previously used. This can also be seen in their upward revisions to the near-term growth forecast for 2018. It now stands at 2.5% versus 2.1% in September with 2019 GDP revised up a tenth to 2.1% and 2020 revised up two-tenths to 2%. They also now project sub 4% unemployment through next year, but have left inflation forecasts unchanged with both headline and core inflation at 1.9% next year and 2% in 2019. 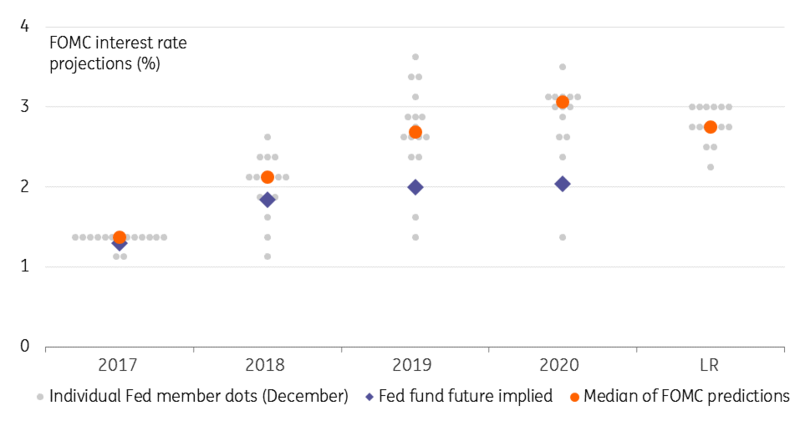 Despite these changes the Fed have not significantly changed the “dots” on their diagram showing individual FOMC member projections for the Fed funds rate. They fully expect to hike three times next year with two more 25bp hikes in 2019 and another two hikes in 2020. The long run expectation for the Fed funds rate remains 2.8%. We agree with the Fed that the risks to interest rates remains on the upside. Growth is 3% while inflation is close to 2% so the lower bound of the Fed funds rate looks low at just 1.25%. We also have to remember that Fed officials have broadened out the justifications for hiking. Fed officials have broadened out the justifications for hiking. For one, loose financial conditions – the flat yield curve and the dollar’s softness – suggest that the Fed has more work at the short end to make monetary conditions more optimal for the state of the economy. Then there is the argument about the threat that a prolonged period of low interest rates could lead to increased leverage with “adverse implications for financial stability”. Another factor that we think is important to consider is the annual rotation in the Fed’s voting structure. Two of the most dovish FOMC officials will no longer be voting in 2018 – Neel Kashkari and Charles Evans – and they are being replaced by two relatively hawkish figures in Loretta Mester and John Williams. This means that with Janet Yellen leaving the FOMC in February we will have a smaller voting committee, with a more hawkish bias. Given officials have also broadened out the arguments for higher interest rates we remain of the view that the market is being too conservative in pricing in only around two rate rises in 2018. We think it will be a minimum of three with the growing prospect of a fourth should the economy respond positively to tax cuts and potential infrastructure spending plans.